For those of you following along both here and in social media land, you may have caught me slipping some not-quite-confirmed news out there about Sly Fox's future [link to Facebook]. Instead, they chose to confirm another "rumor" that had been floating around - that of opening a brewpub in Berks County. Wyomissing to be specific. On the old Vanity Fair outlet complex property to be even more specific. This strikes close to home for me, literally, as I was raised in Berks County and had my back-to-school fashion needs taken care of with shopping at the outlets - for Lee jeans and other stylish duds. So in keeping with my proclamation last week that I'd begin sharing select press releases with you, I believe this one certainly falls under the umbrella of news you can use. Sly Fox beer is already distributed in five states, plus D.C., and this move serves to further shore up and invest in their home turf, which I think is a critical move for mid-tier/regional brewery, particularly those of a similar certain age. And, did someone say "indoor Kan Jam"?! 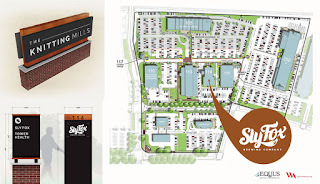 Regarding that other rumor - another new Sly Fox location, in Malvern, Chester County? That will have to wait for another day. Pottstown, Pennsylvania – For more than 20 years, Sly Fox Brewing Company has remained focused on producing quality lagers and ales while building a reputation for their establishments—two festive pubs in southeastern Pennsylvania featuring a revolving list of award-winning beers and a lineup of can’t miss events. A legendary goat race, a massive outdoor concert and Boot Camp– where the brewery gives away a trip to Ireland on St. Patrick’s Day–are just a few of the many creative events that contribute to making Sly Fox pubs unique in the universe of craft beer destinations. Since opening their doors in 1995, the Sly Fox pubs have become local fixtures, community allies and favorite spots for beer appreciation. Celebrating, meeting friends and enjoying consistently creative cuisine is what we are about. The family-owned operation is launching a third location just 20 miles west of the Pottstown brewing operation, in Wyomissing, Pennsylvania. 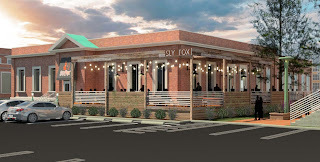 “We look forward to immersing ourselves in the community and working with local charities and creating activities at the new location,” stated John Giannopoulos, Sly Fox Brewing Company president. The newest Sly Fox outpost will be located at 801 Hill Avenue on the eastern edge of the Borough of Wyomissing in a renovated building that was formerly a part of the expansive VF Outlet. Most recently a Dooney & Bourke™ retail store, the building that Sly Fox Wyomissing will call home is part of a development poised to transform Wyomissing into the ideal live, work, and play location in Berks County. Philadelphia-based Equus Capital Partners purchased the 24-acre center from Vanity Fair Corporation at the end of 2016 with the intention of redeveloping it as a mixed-use campus. Equus has committed more than $70M into Phase I of the Knitting Mills, and Phase II, a 20-acre site north of the main campus, has already attracted corporate tenants interested in new construction build-to-suit offices. The 7,000+-square-foot building features two floors and will include a newly installed wrap-around deck. Materials, including 100-year-old bricks from the original Berkshire Knitting Mills, will be featured prominently into the Sly Fox decor and buildout. Sly Fox Wyomissing will focus on developing a fresh and locally sourced menu to accompany their well-regarded beer portfolio. The convenient location, just off of Penn Avenue, is a prime spot for foodies and craft beer aficionados. Sly Fox has had a strong presence in Berks County for many years. The brewery formed an alliance with the Reading Fightins two years ago and sponsored the team’s Power Alley Pub. “We are thrilled to get Sly Fox as a lead tenant and believe they will attract other restaurants and stores as well as providing an important amenity for the employees located on campus and residents of Wyomissing and West Reading,” offers Kevin Flannery, acquisition associate and asset manager at Equus Capital Partners, Ltd.
Sly Fox Brewing Company’s Wyomissing announcement comes hot on the heels of other ambitious changes at the brewery that are being positively received in the beer community. These changes include a brand refresh and three new offerings: Sly Fox Mudlust Coffee Porter, Vulpulin IPA and Alex’s Lemon Wheat, a brew that benefits the Alex’s Lemonade Stand Foundation. Since their inaugural brew in 1995, Sly Fox has crafted more than 100 different top-notch craft beers. Their critically acclaimed year-round lineup and highly anticipated seasonals are available in their brewpubs in Phoenixville and Pottstown, as well as top bars and restaurants in PA, NJ, NY, MD, VA and Washington, DC. They were the first craft brewery in the mid-Atlantic to put in a canning line, adding it to their facility in 2006, and with it, earned the first-ever Great American Beer Festival (GABF) medal awarded to a canned craft beer, in 2007. They have earned GABF medals virtually every year since, including a gold medal for Grisette Summer Ale in 2017, and are widely recognized as among the region’s best and most enduring craft breweries.